Cannot be Normal Summoned/Set. Must be Special Summoned (from your hand) by banishing 5 “Metaphys” cards with different names from your GY and/or face-up from your field. Cannot be destroyed, or banished, by card effects. Once per turn, if your opponent controls more cards than you do: You can target 1 of your banished “Metaphys” monsters; Special Summon it, but banish it during the End Phase of the next turn. Metaphys Executor can be a field dominating card for the archetype. It may cost you five of your “Metaphys” cards on your field or in the grave, but this card is worth it. Self-protection against destruction or banishment via card effects and a Special Summon ability of a banished “Metaphys” monster each turn. Yes, the Metaphys cards you banish have to have different names, but that shouldn’t be hard in the archetype. The Special Summon can only happen if your opponent has more cards than you, but a free Special Summon is still great. The next turn that monster gets banished again during the End Phase, but it should already be used for a Special Summon or used as a resource for another card. 3000ATK with LIGHT and Wyrm support behind it will greatly help. High cost to Special Summon, but if you can afford it in the archetype you’ll have a strong monster that won’t have to worry about destruction effects. We continue into Circuit Break with what is likely meant to be the boss of the Metaphys deck, Metaphys Executor. Metaphys Executor can only be summoned by banishing 5 Metaphys cards with different names from the GY or face-up on your field. Most of the Metaphys monsters want to be banished, because their effects trigger after they are banished. 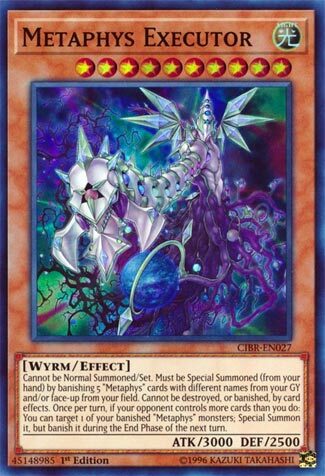 Metaphys Tyrant Dragon will let you summon another Metaphys, Metaphys Nephthys will get you a search. Metaphys Daedalus will banish another Metaphys from the deck for you. You got some good effects, and the bigger Metaphys effect monsters have effects if they were summoned by a Metaphys effect, which is good because Executor can summon a banished Metaphys if your opponent controls more monsters. Getting back Metaphys Ragnarok is good because that helps get more Metaphys monsters back and it doesn’t put itself back after being banished unlike Tryant Dragon, Nephthys, and Daedalus. To put the icing on the cake, Executor cannot be destroyed or banished by card effects, so he is harder to get rid of. The card is a good boss monster, but I think only one is necessary in most Metaphys builds. Banishing 5 is a high cost, despite cards like Metaphys Factor, Asmetaphys, and Metaphys Dimension being good Spells and Traps for the deck that are staple. This card can be a brick, but run one just to have it when you need it. This card has a LOT of text on it for a card that doesn’t honestly do all that much. Level 10, Wyrm, Light, 3000 attack, it seems like this guy should have lots going for it. The Special Summon ability is nice, but fairly difficult, even in it’s Deck. Removing the five required Monsters is a BIG cost, even if through his latter effect you can retrieve them (for which you better be winning or using them for something else, as you lose them again almost as quickly). The protection from card effects is very nice, and all but being forced to destroy a card by Battle with 3000 attack is a good thing definitely. I like the card and the Deck, but I don’t see it as ‘all that,’ to turn a phrase. Next articleIs Gaming at Ultra Settings Worth It?